www.tabpilot.com ■ Retail Price: $5-$10 one-time license per device (based on quantity) plus $5-$10 per device per year for Control Tower subscription. Device quantity includes all student and teacher devices registered in the system. TabPilot Tablet Manager is a combination mobile device management (MDM) and classroom management system for iOS and Android. Quality and Effectiveness: TabPilot Tablet Manager offers user-friendly features to maximize the effectiveness of tablet deployment, use, and management in a classroom, school, or district. TabPilot jumps well ahead of other packages in its category because of its design and functionality. FocalPoint, a browser-like app, can be bundled with the Manager license and deployed to restrict external links, which can be very useful in K-12 settings. Ease of Use: TabPilot Tablet Manager is sophisticated enough to support any approach to tablet management a school can imagine. (Having implemented device deployment in three different schools I can attest that each approach is unique.) Tech experts and teachers alike can operate TabPilot Tablet Manager through a visually well designed Control Tower dashboard. The software is very responsive, loads quickly, and has clearly labeled functions for ease of navigation. Support materials include thorough video tutorials to get started and a helpful staff to respond if questions or problems arise. The owner and lead software developer works closely with customers to ensure continuous quality improvement. Creative Use of Technology: TabPilot’s colorful interface distinguishes it from the competition. The dashboard displays an organized list on the left that includes Profiles, Apps, and Users, and associated tabs on the top of the screen allow for easy navigation. 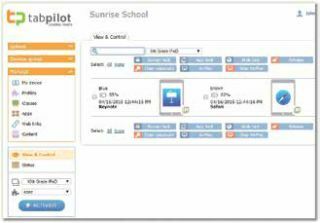 Unlike other device management packages, TabPilot permission options can be selected for teachers. These preferences include the option to create active profiles for different classes, to fetch and push apps, to lock screens, to monitor screens, and to upload and display unique background images to visually differentiate her/his class on device screens. Suitability for Use in a School Environment: If your school or district is contemplating rolling out a BYOD or 1:1 device program, or if you are considering switching from a current, cumbersome, or expensive management system, TabPilot Tablet Manager can help improve your process and budget. The system is also good for shared-use (i.e., carts or classroom sets) implementations as well. The cost is approximately half of the device management system our school currently uses, for example. Your tech administrator can create a profile for each classroom, batch upload student information, and easily deploy apps. Once student information is uploaded and apps are listed in the system, teachers can choose which apps to use for her/his class and can also easily freeze students’ devices onto one app, print individual screens as evidence of exemplary work or inappropriate location, and install and uninstall apps. TabPilot Tablet Manager earned my highest rating. Its unique functions put it in a superior position among its competitors. Teachers will especially appreciate having more control over their classroom devices without having to contact IT, including being able to install and uninstall apps spontaneously. ● TabPilot Tablet Manager’s superior features, functionality, and easy navigation are sophisticated and flexible/versatile enough for one school or the whole district. ● Teachers can use TabPilot Tablet Manager to view apps on each device, install and uninstall apps, print individual screens, and lock device screens on one app. ● FocalPoint, a browser app, can be set to restrict access or allow exploration of external Web sites.